If you asked me for a list of Atari games that I never expected to see again, Choplifter would have been somewhere between Demons to Diamonds and Duck Attack. Still, I’d be lying if I said my fuzzy childhood memories of saving refugees in a boxy helicopter weren’t clamoring to relive the past. 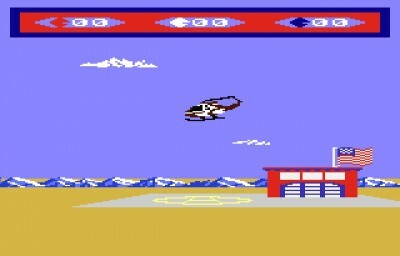 Choplifter was a popular 80’s arcade and console game that has sat undisturbed for decades. It involved flying a helicopter through enemy infested territory and rescuing survivors while defending against an onslaught of opposing forces. 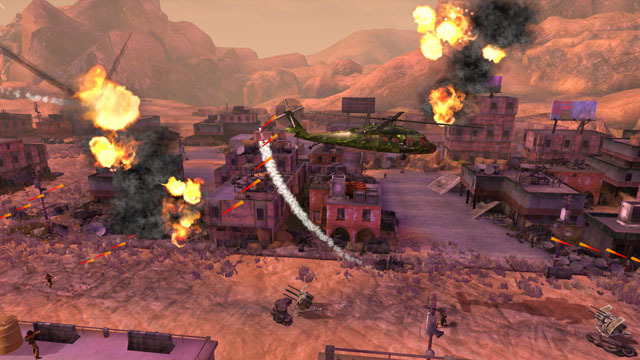 Choplifter HD does all of these things in detailed war-torn backdrops with two dimensions of action and extra objectives, but while it does these core elements well, it doesn’t do anything well enough to warrant extended play. Choplifter HD is basically a 2D sidescroller with dual-stick shooter controls. For most of the game’s considerable campaign you’ll find yourself zooming over the battlefield managing ammo and fuel as you search for the quickest and safest way to rescue survivors among an all out war. It takes a keen mind to manage your fuel and weapons while dodging rockets, grenades, and gunfire to achieve the highest score possible, and the inclusion of online leaderboards will push some players to perfect their runs. The game excels at all these core mechanics and the beginning levels are fun to replay, however, many key design flaws turn this quick firing rescue chopper into a deflated blimp of broken dreams and lost time. The difficult curve in Choplifter HD is more a difficulty wall–which you will smash into early on. The poor lock-on system makes for haphazard shooting when large hordes of enemies begin filling the screen and will almost always lead to a frustrating death. The game infuses some missions that ask you to deliver a special unit or defend a fort against zombie hordes, but even these instances fall short among bad controls and unfair AI. Nothing is worst than landing near your painfully slow survivors while enemies respawn all around you and obliterate your helicopter. The graphics aren’t bad, but aren’t good either. Any time you lower your helicopter to the ground you’ll notice bad textures, and some enemies are hard to locate among the cluttered foreground. Speaking of foreground, having to change your direction to shoot at screen facing units is a hindrance to the flow, especially when you’re being attacked from all sides. And with such bland mechanics it’s hard to find the motivation to continue after a cheap death. It doesn’t help that the voice acting is abysmal and the dialogue tries too hard to be funny. I was begging to take a break whenever five survivors, clamoring to commit suicide under my descending chopper, were all screaming at me about poker games at the same time. Not to mention it’s never fun to be asked if it’s your first time flying every time you have a less than perfect landing. Choplifter HD isn’t terrible; it’s a decent homage to an arcade/Atari game from the 80’s. But if you remember, we liked these old 80’s games because we only needed to play them for about 20 minutes to get what we needed and that is about how long this remakes remains fun. For an outlandish $15 on the PSN and 360 Marketplace, you might want to just let this franchise die on the battlefield.